Caution: Sappy Personal Post Ahead. The holidays always fill my heart with endless amounts of gratitude for situations that have happened, moments in time, and it’s a beautiful yet meaningful time to reflect and be with the ones you cherish most. For those who have followed our blog since 2012, you know my history, my struggles, my growth both personally and professionally. It’s been an incredible journey and today I can confidently say that I’m a wife to a man who is better than me and I am proud of (and love) it. Davíð Geir Jónasson, looks at me the way all women want (and deserve) to be looked at by a man. I’ve never laughed harder, never travelled farther around the world with anyone and still left smiling by the end of it. To put it raw and frankly, I’m addicted to him. His energy, book to street smarts, risky wit, infinite positivity and the way he brings out the best in everyone he encounters. He adventures at the same level as me (some might even say higher and I might agree). Enough gush. Go back HERE to read more about how we met (super GOOD story), our relationship and proposal. But! Back to today’s topic: Meeting in Iceland to Having a Lofoten Islands Elopement Adventure. We chose to elope. Why? It felt right for us. 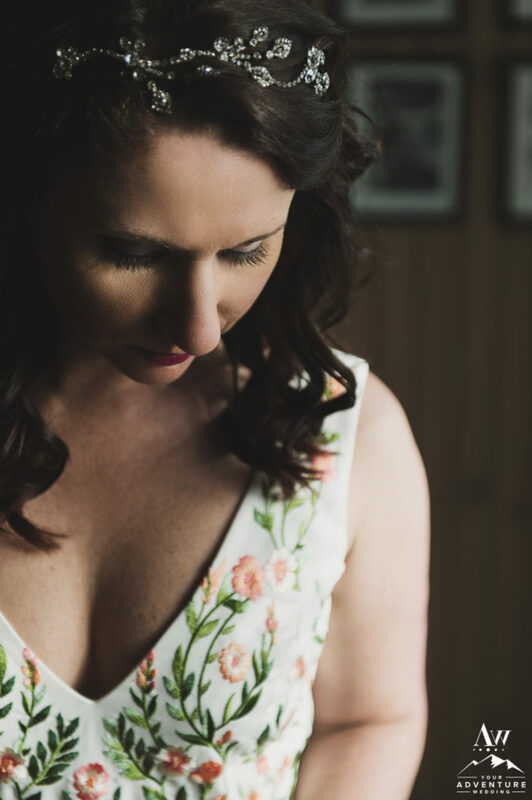 Being an adventure wedding planner and photographer (and Davíð in the film industry), we look at wedding days way differently than most of the world. Much like what my clients come to me for, we were looking for something DIFFERENT and a place that had enough beauty and adventure in it for us both. Have you heard of the Lofoten Islands? It’s a spectacular place in Northern Norway. The shapes, the tones, the textures of the vivid mountains of the Lofoten Islands cannot be found anywhere else in the world. They come chock full of mystery and unforgettable romance. 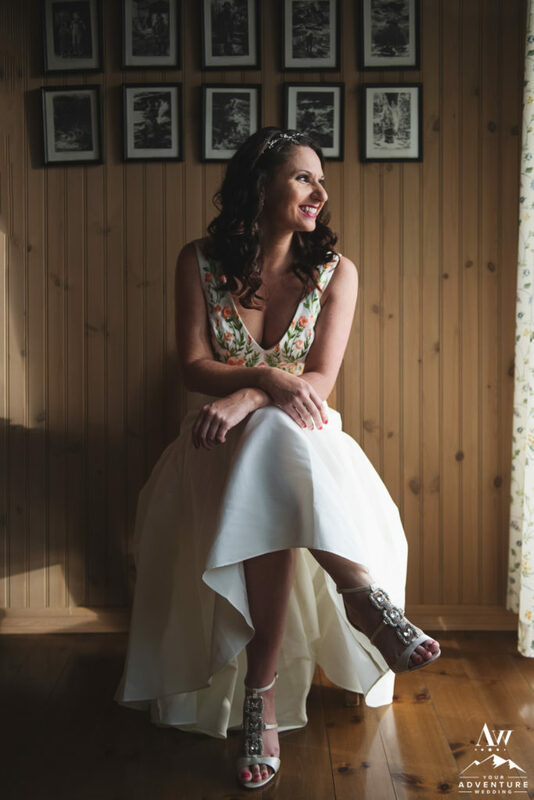 So come along with me today as I, my super talented friend (and colleague) Jean Smith and her brilliant cinematographer husband Travis Smith share with you the unbelievable documentation from our Lofoten Islands, Norway wedding day. The winding roads of Norway, led us to one of the prettiest areas of the Lofoten Islands for our wedding adventure. 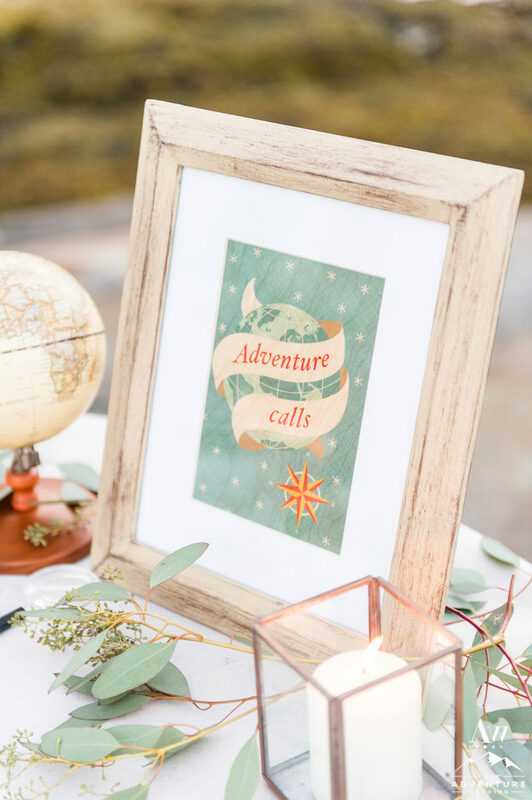 I’m a firm believer that even if you elope, you should still have gorgeous details to compliment your adventurous love story. This also means I had to have a Norway wedding welcome bag for our photographer and cinematographer guests. Having local treats (like chocolates, a guidebook, wool gloves, dried fish, etc) enhances the experience and makes people smile upon arrival! Plus, um did you see the bag and the lunchbox?! I’m still in cuteness overload! Having an adventure wedding anywhere in the world, it’s a good idea to have two wedding dresses. Mainly because you never know what the weather will be doing and one may look better better in rain or wind, etc. Since I preach this every day to my adventure wedding clients, I actually planned 3 wedding dresses and 3 pairs of shoes/boots (and my husband brought two suits/shoes as well). Fun Fact from our Lofoten Islands Elopement: Davíð handcrafted my destination wedding bouquet. We actually filled up a suitcase full of flowers/ greens and this is in the end what my fresh flower bouquet looked like… Side Note: Having so many dresses, I actually had 3 wedding bouquets as well. Having planned and photographed hundreds of weddings over the years, fresh flowers never withstand the adventure aspect of our weddings so it’s nice to have a backup or two that are fake, but real looking. My favorite vendor who accomplishes this is Southern Girl Weddings. 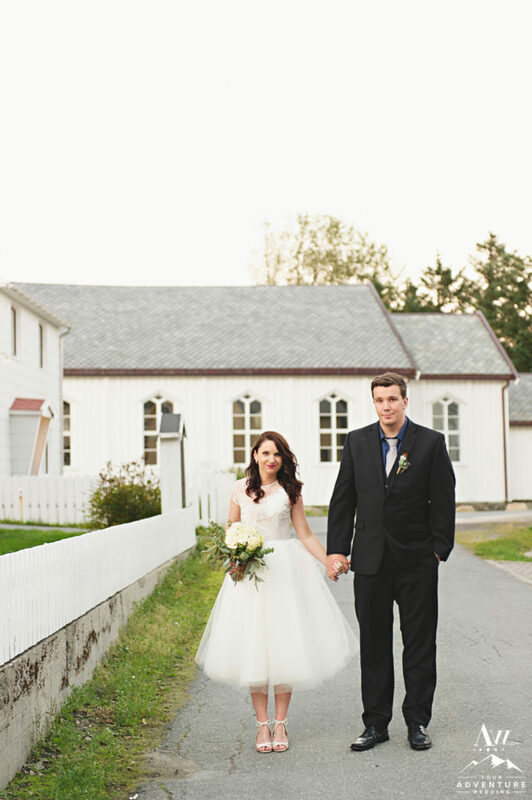 Lofoten Islands Norway Elopement Tip: Leave superstition / tradition behind and get ready together. It decreases the any stress you might have and gives you fun memories like these! We scouted and chose our Lofoten Islands wedding locations very carefully because of the way the light falls on these magical mountains. It falls fast, deep, and runs out quickly. Each spot we chose not only had a meaning, but at each we held part of our Norway wedding ceremony. Since we had already been “legally married” on paper in Iceland earlier, we could focus completely on each other, the meaning behind each part, and the adventure. First up was us reading our wedding vows. We’ve moved mountains together, so naturally we have to dance around in front of them! Entrance of dress #2: The beach was WAY too windy and the other dress would have looked lame! 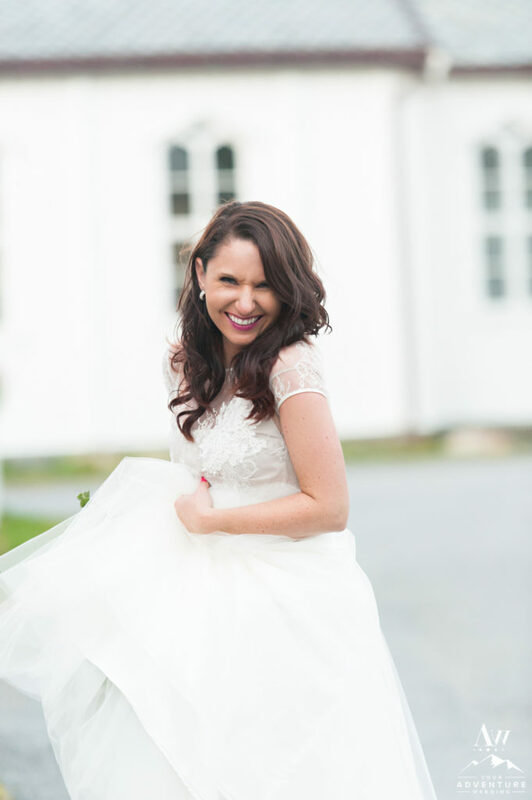 Norway always provides a dreamy amount of wind for a wedding dress! What Lofoten Islands Norway wedding would be without a token ceremony? Davíð is not a fan of rings so we exchanged a watch (JS Watches Reykjavik) and a ring. …and would a adventure wedding planner have a Lofoten Islands wedding ceremony without it being styled? Nope! Nordic Love is the inspiration on this setup. Thousands of petals from my favorite folks at Flyboy Naturals. We decided to incorporate our “first drink” together and have it be out of a Viking horn. Champagne of course! The day could not conclude without having a stylish dinner for two during our Lofoten Island elopement. Our theme: Romance and Adventure Collide. 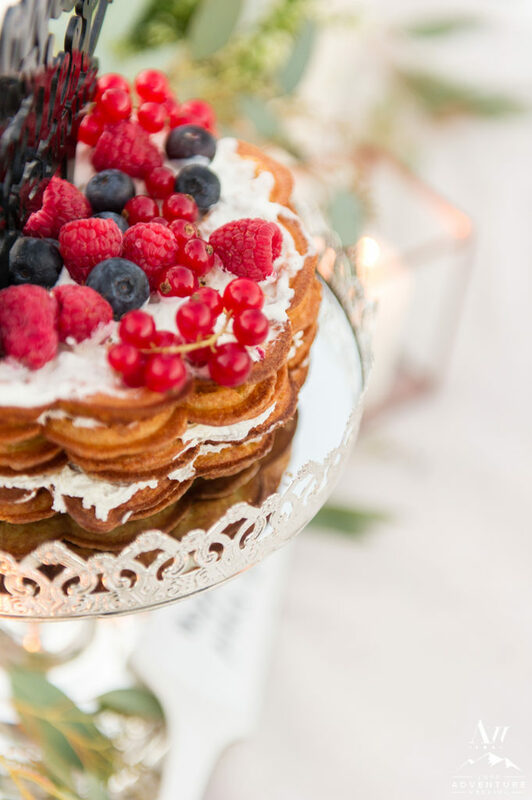 Hello Waffle Cake, You Look Delicious. 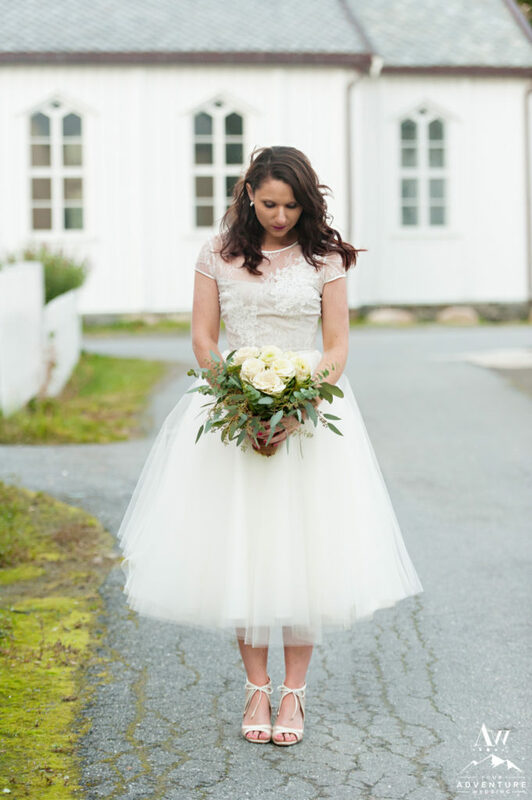 A must have for your Nordic wedding (or Lofoten Islands elopement)! Beef filet and whale were on our Lofoten Norway wedding menu! Words cannot properly express the emotions that stir when we watch this video (which is like everyday). I strongly encourage you to find it in your budget to hire an adventure wedding photographer AND a cinematographer (not just a videographer) to forever document your love story. Just do it. It’ll pay dividends in happiness and forever newlywed status later. 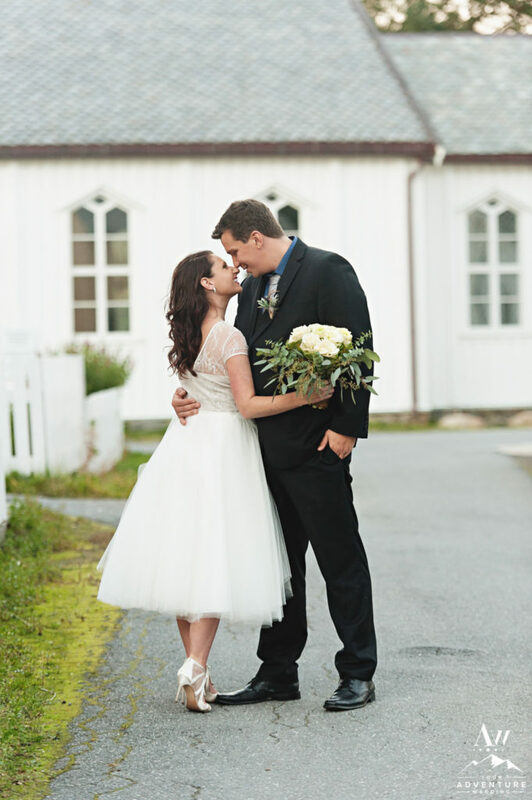 Thanks for joining us on reliving our Lofoten Norway adventure wedding! We hope it has provided you a little fun inspiration or at least made you smile! Stay tuned next week for our Iceland Wedding Planner Best of Year End Review! In the meantime, we wish you a very Merry Christmas! © 2016, Iceland Wedding Planner, All Rights Reserved.